First Concert of 2015-2016 Season! This month you have not one, but two, opportunities to hear us sing. The first is 9:30 AM, Sunday morning, May 17, 2015, at St. Nicholas Episcopal Church, 350 U.S. Route One, Scarborough. And the second is on that same Sunday at 5:15 PM, at St. Luke’s Cathedral, 143 State St, Portland. For both services, we will be performing three pieces from our Preble Street concert: Going Over Home, Leonard Cohen’s Halleluia, and Walk A Mile. We hope you can join us at one of these services! Mark your calendars! We now have a confirmed concert venue and time: 2:00 PM, Sunday, March 29, 2015, at Cathedral of Saint Luke, 143 State Street, Portland, ME 04101. We’ll be posting more about the concert within the next couple of weeks. 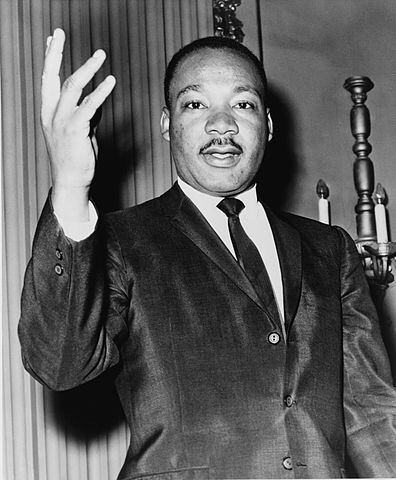 On Monday, January, 19, 2015, the NAACP is hosting their 34th Annual Martin Luther King, Jr., Holiday Breakfast, and we are thrilled to have been given the opportunity to sing for the arriving guests! We will be performing five pieces in the lobby of the Holiday Inn on Spring Street in Portland. We expect to begin singing at 7:30 AM and will be finished before the breakfast begins at 8:30 AM. Click here to go to the NAACP website for information on all of the activities planned for the holiday. 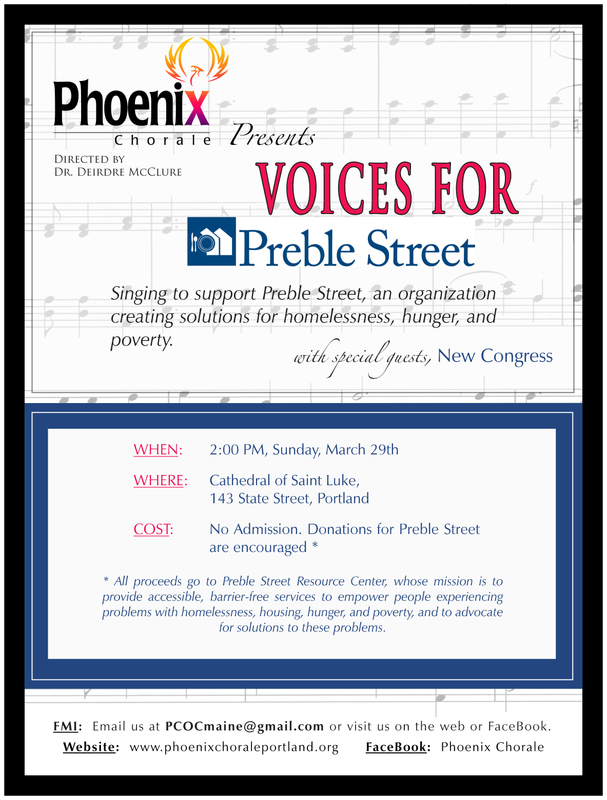 Our first concert will be held in March, 2015, for Preble Street, the organization we are currently partnered with. The exact date, time and venue will be posted here just as soon as we’ve nailed it down. Please check back regularly, or Follow us to receive notifications of new postings on this Concerts page. Preble Street provides many lifelines for Maine’s homeless population, serving meals 365 days a year, and providing outreach, clothing, employment counseling, and shelter, as well as other much needed services. We encourage you to get involved in whatever way you can, such as volunteering your time, making financial or in-kind donations, or spreading the word to your family, friends and acquaintances. 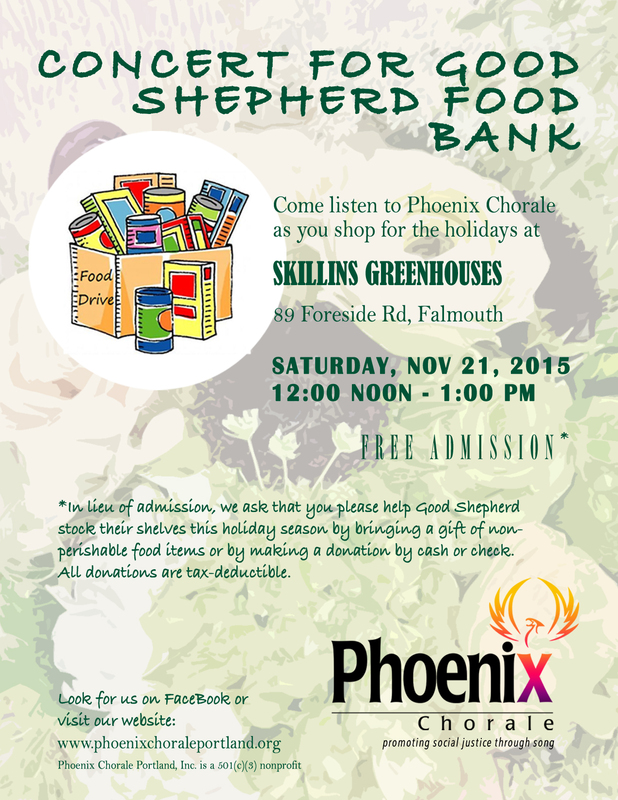 Read more about how to help this organization on Preble Street’s You Can Help page. Welcome to our concert postings page! We will be posting here each time we set a concert date and venue. Please check back! If you “follow” us you will receive an email notice each time a new concert is announced.